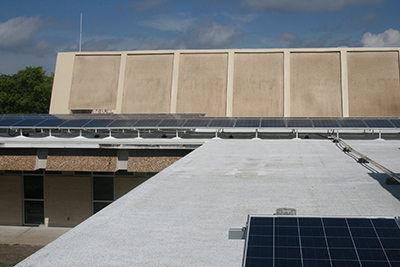 Eckerd College, St. Petersburg FL - 50 KW (ATF) Spray Foam - DLSAS Installation. SunTrust 50-Kilowatt , the worlds first Foamed in Photo Voltaic "SPF-DLAS" System. President Clinton re-opened the Marche En Fer in Port au Prince, a Stand Alone 110 kw Battery Backed PV Installation.